Prozac turned 25 this year. It started being sold in the US, following a fair bit of testing and a year in Belgium, in January 1988. Prozac itself is merely a brand name (like Aspirin) for Fluoxetine. Clearly that name wouldn’t have sold a lot of brands so some bright spark came up with Prozac, which means nothing but sounds like it should. It’s success can be measured in the number of prescriptions made in 2010 – 24.4 million. That’s a lot of apparently depressed people. Not that fluoxetine is prescribed just for depression. It seems it’s also quite good for cases of binge eating, OCD (I should get some for Nicktor), bulimia nervosa and a few other things mainly related to the brain. But does it really matter whether it works or not? The fact remains that it helps a lot of people and if that’s just Placebo Effect then, what of it? It’s not that difficult to trick the brain into thinking something is good for it. Take the ridiculous homoeopathy, for instance and the various blind tests into placebo testing. And it’s not hard to see how it works. A doctor sees a patient and assures them that fluoxetine will make them feel a lot better. The doctor is someone the patient trusts; someone who knows about ‘those sorts of things’. The doctor even goes so far as to tell them how long it will take and when they’ll start feeling better. Job done. And is there anything wrong with that? After all, there are an awful lot of people who believe in prayer, chanting or dancing naked, around a campfire as a cure for various ills. Most of them are doing no harm to anyone but, in some sort of strange, brain fooling way, they believe it so much, that it works. So, happy (belated) birthday to Fluoxetine, the wonder drug. Whether you actually do anything maybe up for debate however, the fact that you have helped a lot of people over the last 25 years is worth celebrating. 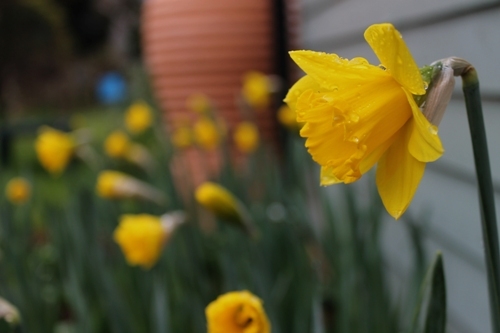 Another thing worth celebrating is the appearance (FINALLY) of our daffodils. I planted them outside the office way back in October and we’ve been waiting, breathlessly, for them to open. They started on the weekend and looked beautifully yellow today. This entry was posted in Gary's Posts, Historical and tagged daffodils, drugs, placebo, Prozac, religion. Bookmark the permalink. Lovely Daffodils. Bet the office wall looks great.